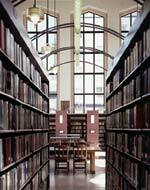 An urban treasure is thoughtfully brought into the 21st century. 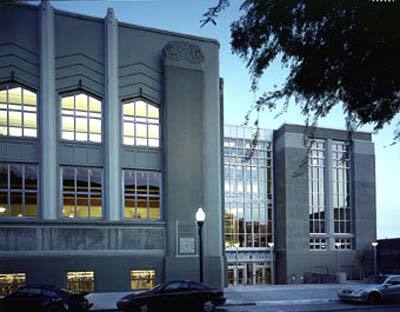 The Art Moderne-style Berkeley (California) Public Library was designed by local architect James Plachek and completed in 1931, and has long been considered one of the downtown area’s major architectural treasures. 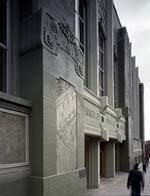 The building’s unusual murals, decoration, and large industrial windows led to its placement on the National Register of Historic Landmarks in 1982. 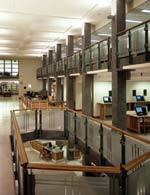 The dilemma, as with so many historic facilities – and especially libraries – was how to make it viable for the 21st century without diminishing its historic charm. 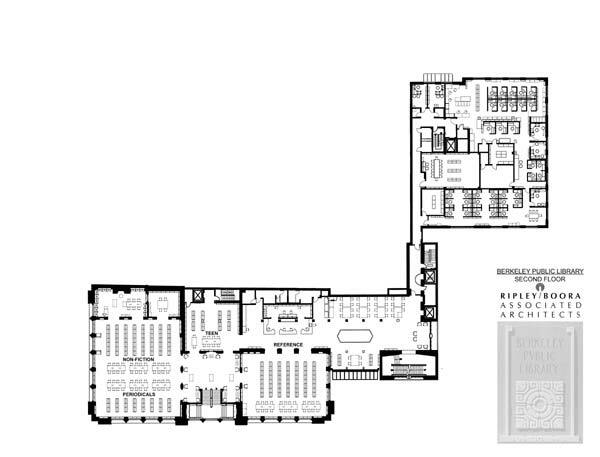 Much of the grandeur in the original, 30,000-square-foot building has been restored, and historic rooms connect directly to the new, 70,000-square-foot addition so patrons can pass from old to new and enjoy the contrast. 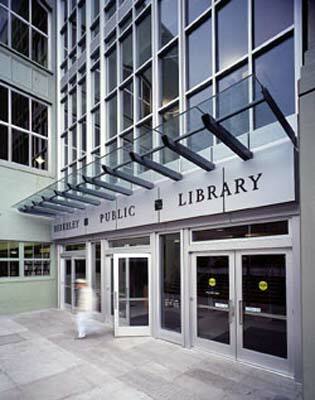 An exterior façade of the original building forms an interior wall at the first, second, third, and fourth levels of the addition. Visually linking the old and new is a five-floor glass curtain wall, which allows pedestrians to view activities within the building, like looking at the contents of an open book. 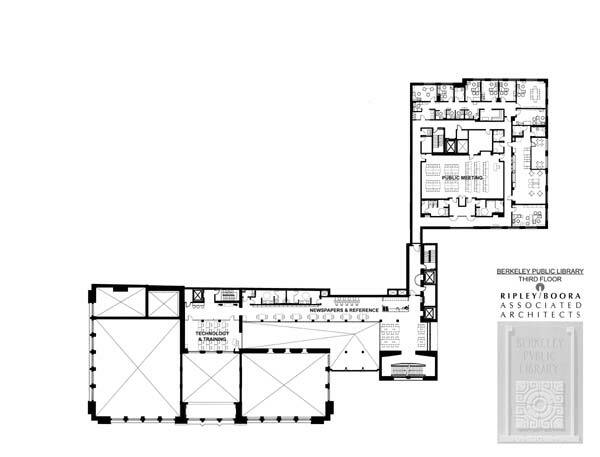 The finishes in the new building, while contemporary, are deliberately plain and direct, in keeping with the simple, subdued design in the original. Plachek’s design featured the theme “steps to knowledge,” visible in the sgraffito murals incised on the exterior plaster of the building as well as in the former main entry, where steps lead up to a grand hall in front of the original book stacks. 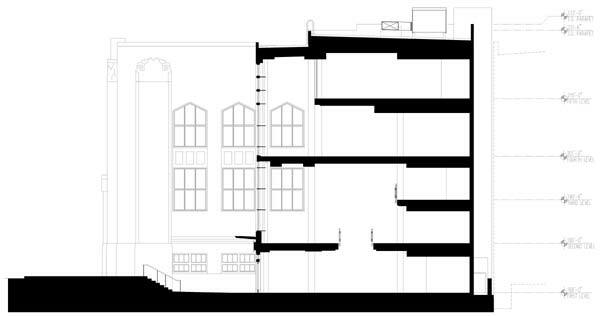 A grand stair at the west corner of the new façade alludes to the sgraffito design beside the original entry. Major challenges in organizing the building included creating access for patrons with disabilities; seismic upgrading to keep the library safe; and perhaps most of all, making it convenient for patrons to find books and other materials. 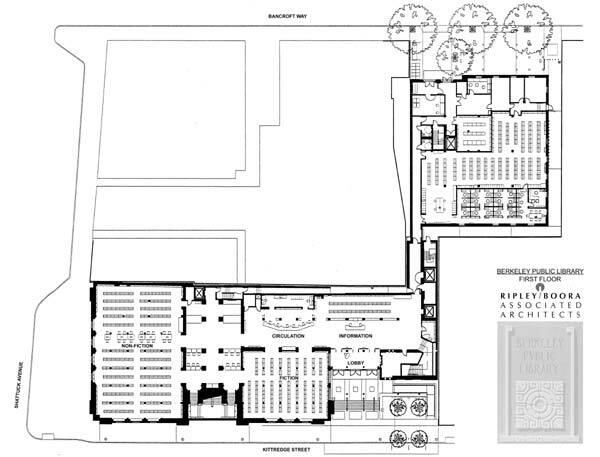 A new accessible main entry is located in the addition, which is set back from the face of the historic building to allow room for the required ramp and an entry court. “By placing a new front door a half-level below the street, we captured valuable square footage on the ground floor and created a dramatic entry with a glass façade that bridges the new to the historic," Cugnart explains. 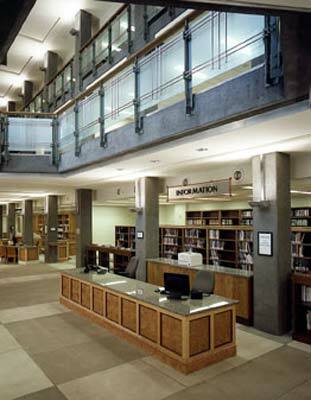 Book stacks and a 1960s addition were removed. 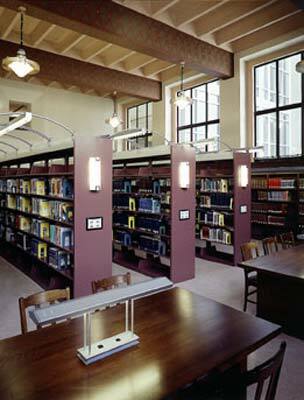 Historic spaces were returned to their original beauty, including the reading room, reference room, and children’s library. 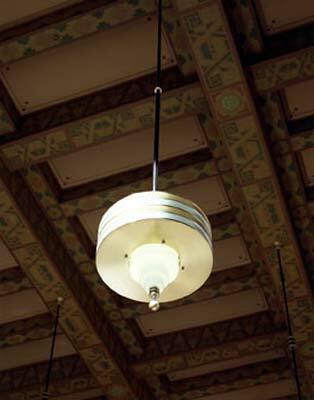 Original lanterns were replicated and intricate ceiling stenciling restored. 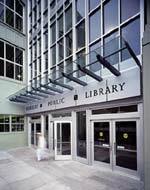 The new addition, which increases the library’s shelf capacity by 40 percent, houses enlarged reference areas, 95 electronic public access terminals, a 16-station electronic classroom, a public meeting room, and staff areas. The new design respects the original structure by using similar forms, materials, and proportions expressed in a contemporary manner. 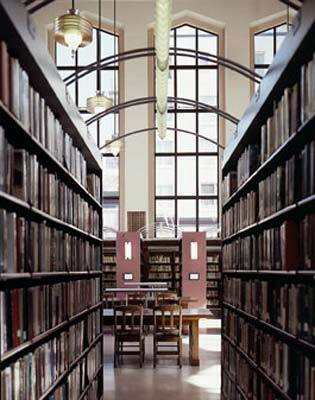 John King of the San Francisco Chronicle called the library ”a building brimming with creativity,” and said, “Even in this age that focuses on narrow interests and distant celebrities, some cities still invest in places that welcome all residents -- and encourage them to think.” Charles Burress, also of the Chronicle, wrote: “…the inside of Berkeley's beloved Art Deco library looks like the frog after the princess kissed it. 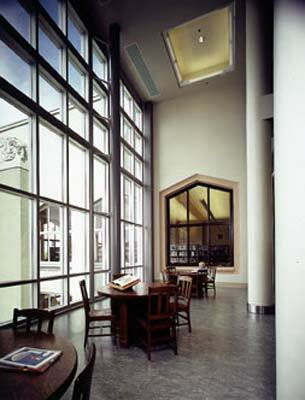 The Berkeley Library renovation/addition opened to the public in April, and was recently honored with a 2002 BAHA Preservation Award at the Berkeley Architectural Heritage Association’s 28th Annual Preservation Awards. 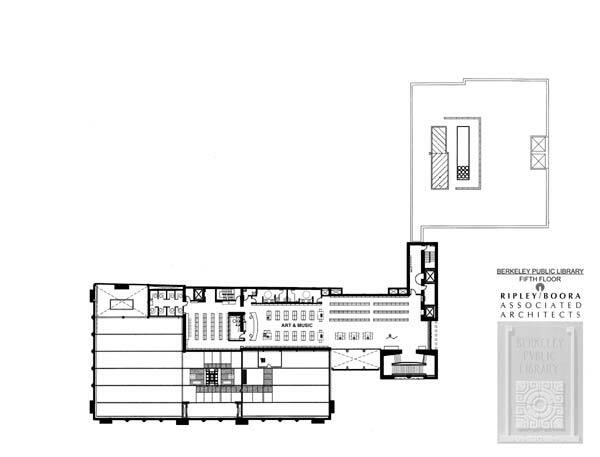 Mechanical/Electrical/Plumbing Engineer: Flack + Kurtz Inc.
Acoustical Consultant: Charles M. Salter Associates, Inc.
Oakland-based Ripley Architects was founded in 1979 by Cynthia Ripley, AIA. 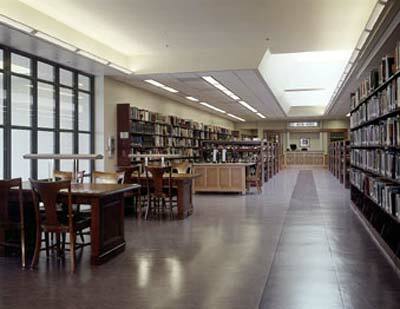 The firm has designed public libraries for Redwood City, Danville, and Santa Cruz, California. 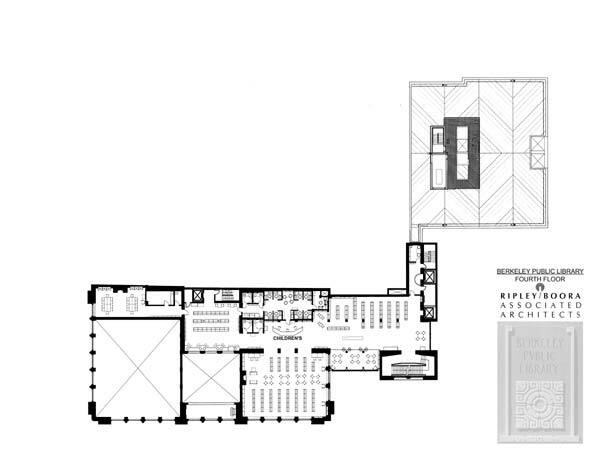 Portland-based BOORA Architects was founded in 1958. BOORA’s local community and arts projects include the Lesher Center for the Arts in Walnut Creek and performing arts complexes at UC Davis and UC Santa Cruz. Page & Turnbull is dedicated to the development of innovative design solutions in historic preservation, architecture, and urban design. 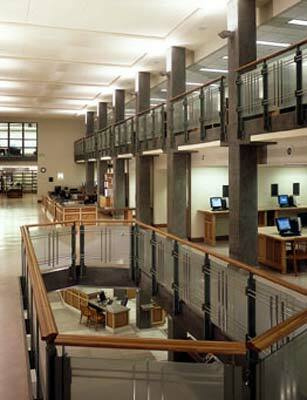 The firm has offices in San Francisco and Baltimore. The Berkeley Public Library includes the original 1931 building (left), and a new addition (right). The restored historic reading room with new book stacks; pendant lamps were recreated from historic photographs. 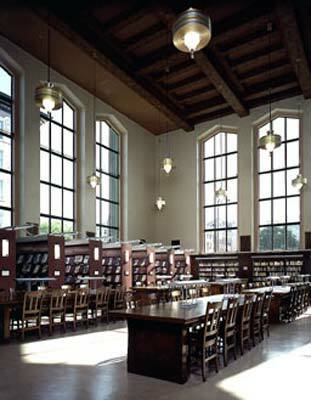 Children's reading tables in the new building are adjacent to children's books in historic building; the height of the new public rooms relates to the historic spaces. On the top floor of the new building the art and music area is filled with daylight.